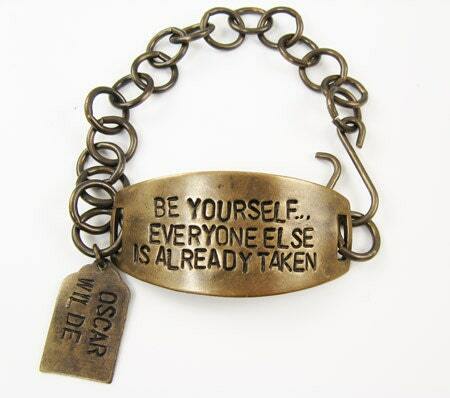 Hand stamped bracelet with Oscar Wilde quote: "Be yourself.. Everyone Else is Taken." All metal is natural brass - no lead or nickel. INTERNATIONAL CUSTOMERS (outside of the United States): I will need your phone number for the customs form. Please include it in the Message to Seller when you check out. International buyers are responsible for all fees including taxes (ex. VAT), handling fees, and duty charges that may be charged once the package reaches your country. Each country has different rules for when and if fees are assessed. If your are unsure of the rules for purchasing from the United States then please contact your post office prior to placing your order. If you are from the UK please understand that the minimum purchase for VAT taxes is quite low. In addition to VAT charges there may also be a handling fee of about £8. If you purchase from Cobweb Corner you agree to pay these fees. Shipping on international orders can take anywhere from 5-8 days to 5 weeks once I've shipped the package. Refunds will NOT be given for unclaimed packages (i.e. Buyer refused to pay import fees). LOVEE!!!!!! 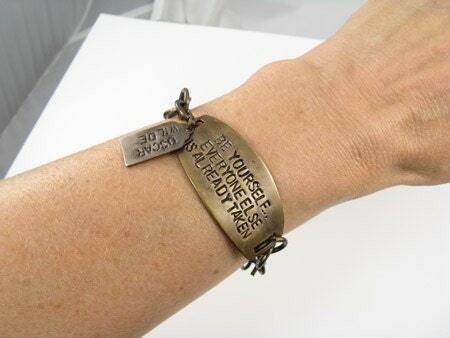 This is the perfect bracelet. It's light and fits perfectly, being a woman I was concerned it would be too masculine for me but it's dainty and nice. This is one of my favorite sayings. Thanks Carla for making this piece I will have it forever. Carla - thank you, thank you, thank you!! my brother LOVES it!! Fast shipping! such an amazing product. 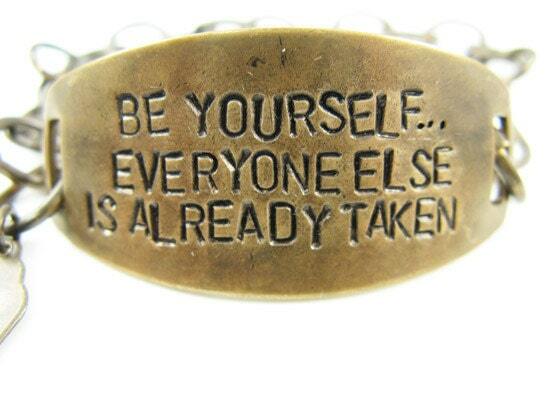 I am in love with this bracelet!! !